Yesterday I printed out a big “Hope” poster and took it down to HQ. A lot of people like it- including Spike Lee. I was so worried about campaign rules- I put on it that I donated the printing- but- neglected to tell people who designed it- which I feel really bad about. So here is everything you need to know- if you are interested- it was done by a graphic designer in California- Shepard Fariey – who was responsible for the “Andre the Giant” “Obey” posters. It was done because Shepard believes in Obama- and was donating the proceeds of his limited edition screen prints to Obama. However- the poster took off- faster and bigger than Shepard could print them- they ended up on E-bay-and it’s got a bit out of hand. Either way, the point is – it stirs emotion- much like Senator Obama does. I’ve told the campaign- to either give it back when they move out- or auction it off for either charity or the Senator’s campaign. I’ve written Shepard twice asking him to put the image out there for all to print and distribute- to help the campaign- and haven’t received an answer. I don’t own the rights, and don’t feel I should be making copies- except for the campaign until I hear back from Shepard. They will be offering a new Shepard Fairey Obama “yes we did-victory” poster starting Saturday November 8, at 12:30 p.m. ET. Actually more WPA. Reminds me of those old Ben Shan posters or those REC posters. Hi Jeff- got any links to share on the Ben Shan or REC posters? The Electrification posters are classic modern- really clean, I’m familiar with both- but hadn’t seen them in a while. 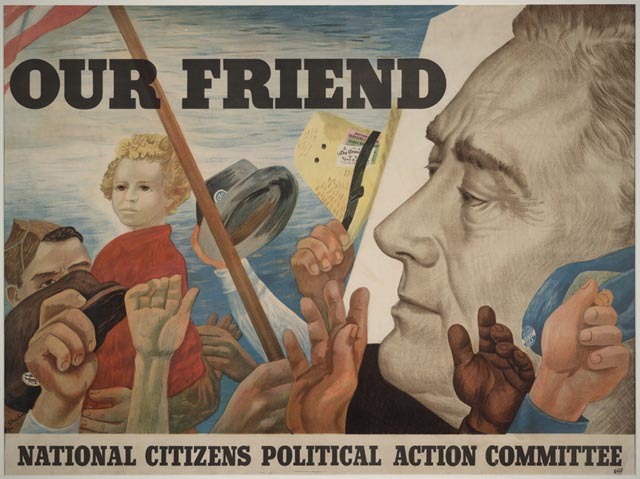 The second Shahn poster is a gem- but I don’t see the connection to what Shepard is doing. But- thanks for the links. I’ll get ambitious one day and find the posters it most reminds me of- and I’ll share. 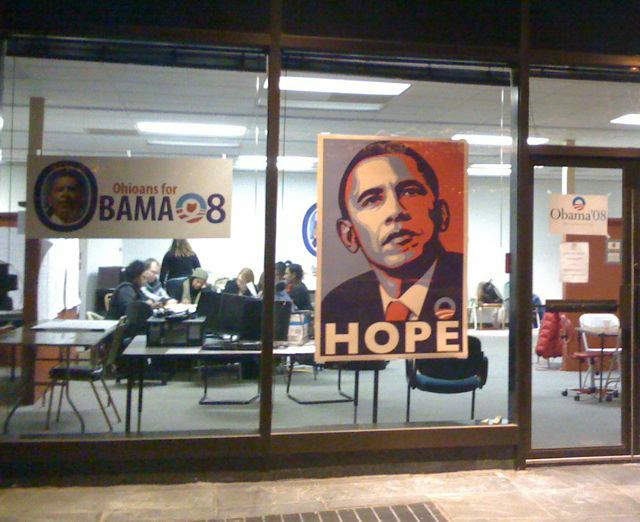 Wow Dave, thats a great poster of Obama. GO OBAMA!! We have black and white pdf one that can be printed in large format. So now, Shepard is being sued by the AP for the image he used.